During 2012, a number of beekeepers shared their beekeeping tips with BuzzAboutBees.net readers, and two beekeepers received a copy of Dr David Heaf's 'The Bee Friendly Beekeeper', courtesy of Northern Bee Books. Many thanks to Katharina Davitt for showing new beekeepers how to make a simple bee brush, and for the sage words of Tel Jensen - how to monitor a bee hive. Tips about buying and cleaning used beekeeping equipment. Tips for buying a bee hive. Bee hive construction help and plans. Watch and learn with these beekeeping video clips. Moving bees if you must. What to plant in your garden - see the section about gardening for bees. General beekeeping tips and information links. You can read a very interesting interview with Dr Heaf here (clicking on the link opens a new window). 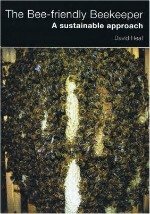 The Bee-friendly Beekeeper by David Heaf is available from Northern Bee Books on line shop (international delivery available). You can find them by clicking here (opens a new window). The book has received excellent reviews.